Universal Serial Bus (USB) is an industry standard which defines the cables,connectors and protocols used for connection, communication and power supply between computers and electronic devices. USB was designed to standardise the connection of computer peripherals such as mice, keyboards, digital cameras, printers, portable media players, disk drives and network adapters to personal computers, both to communicate and to supply electric power, but it has become commonplace on other devices such as smart phones, PDAs and video game consoles. USB has effectively replaced a variety of earlier interfaces such as serial and parallel ports, as well as separate power chargers for portable devices. The first USB was made by Intel in 1995. The original USB 1.0 specification, which was introduced in January 1996, defined data transfer rates of 1.5 Mbit/s “Low Speed” and 12 Mbit/s “Full Speed”. The first widely used version of USB was 1.1, which was released in September 1998. The USB 2.0 specification was released in April 2000 and was standardized by the USB Implementers Forum (USB-IF) at the end of 2001. Hewlett-Packard, Intel, Lucent Technologies (now Alcatel-Lucent), NEC and Philips jointly led the initiative to develop a higher data transfer rate, with the resulting specification achieving 480 Mbit/s, a forty fold increase over the original USB 1.1 specification. USB 2.0 (High-speed USB) provides additional bandwidth for multimedia and storage applications and has a data transmission speed 40 times faster than USB 1.1. 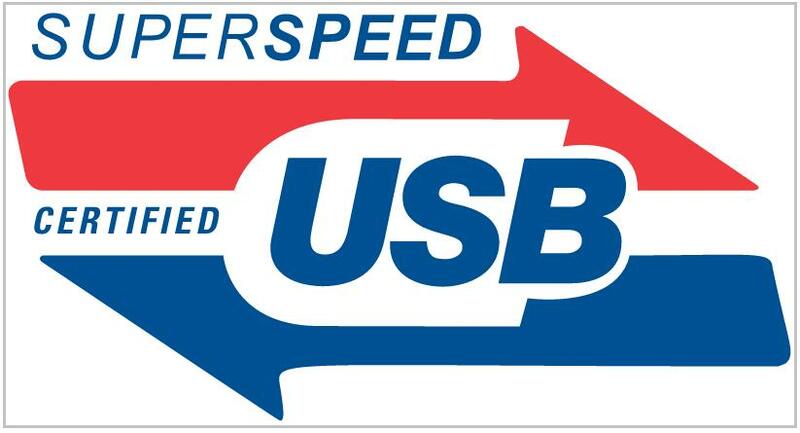 The USB 3.0 (Super Speed USB) standard became official on Nov. 17, 2008. USB 3.0 boasts speeds 10 times faster than USB 2.0 at 4.8 gigabits per second. It’s meant for applications such as transferring high-definition video footage or backing up an entire hard drive to an external drive. As hard drive capacity grows, the need for a high-speed data transfer method also increases. Super Speed USB has a 5 Gbps signalling rate offering 10x performance increase over Hi-Speed USB. Super Speed USB will provide Optimized Power Efficiency. No device polling and lower active and idle power requirements. 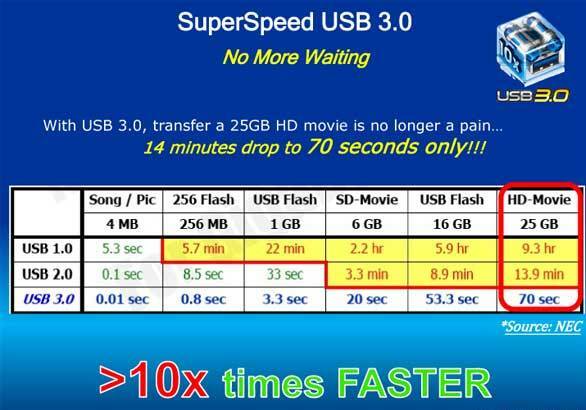 Super Speed USB is backwards compatible with USB 2.0. Devices interoperate with USB 2.0 platforms. Hosts support USB 2.0 legacy devices.